The local longboarder was the one to beat after starting the event with a 7.77 (out of a possible 10 points) and moving into an early lead where he stayed after scoring an 8.33 to claim the win. While Mullaloo’s Scott Trew was also one to watch after his preliminary rounds performance, it was Yallingup’s Justin Redman who challenged Clarke, scoring a 6.80 and 6.70 to take second and Trew came in third. Clark, who has now moved into the lead on the longboard ratings, said he was happy with the result. ‘It was pretty tense out there with everyone wanting to win this one and it must have been a hard one for the judges to call,’ he said. Mullaloo’s Izzy Marchetti also put in a good performance, coming fourth in the open women’s longboard then second in the under-18 girls along with Virginia Marchetti who came fourth. Also from Mullaloo was Gary McCormick who came third in the over-55 men’s. 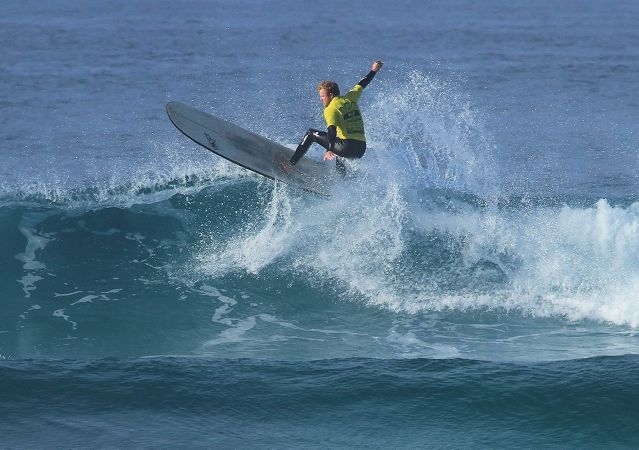 The final event of the WA Longboard Titles heads to Mandurah on June 29 and 30.